Hello and Welcome to our preview for the United Arab Emirates vs Zimbabwe match. 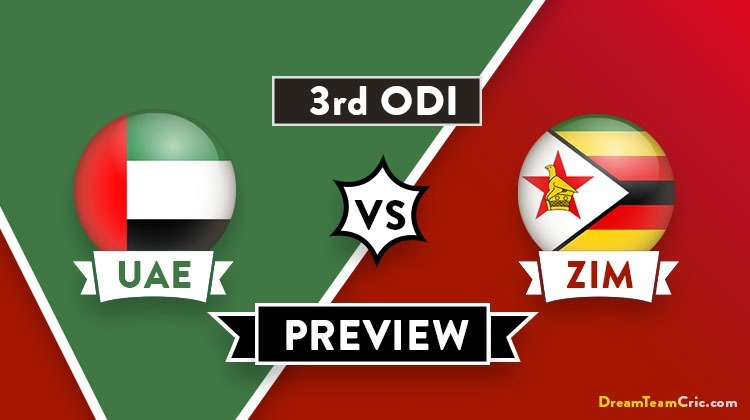 We are covering UAE vs ZIM Dream11 Prediction, Preview and Probable Playing XI for the ODI match. The match is to be played at Harare Sports Club. UAE is yet to get a victory in their tour of Zimbabwe expects Practice match. They lost both the ODI’s easy to all-around Zimbabwe team. In the last match, Batting first UAE scored 169 runs in 35 overs in a rain-affected encounter. Shaiman Anwar and Ghulam Shabeer played impressive knocks of 72 and 56 respectively. Defending the target, Rohan Mustafa took two crucial scalps and was supported by Zahoor Khan and Imran Haider but could not defend the target and lost the match by 4 runs. They will be determined to put a unison effort tomorrow and keep the series alive by defeating Zimbabwe. Team Zimbabwe is one win away to seal the series. They are performing well as a team and have all the ingredients to give a tough challenge to the UAE. Good top-order, Quality all-rounders, Witty spinners and most importantly lethal pace attack makes them a solid team. In the last match, Pacers Kyle Jarvis and Donald Tiripano were all over visitors taking four and three wickets respectively while Regis Chakabva and Peter Moor played match-winning knocks of 78* and 45* respectively. They will hope to continue the winning momentum and get another victory over the UAE. Zimbabwe vs the United Arab Emirates, 3rd ODI, UAE Tour of Zimbabwe, 2019. Pitch will give the early advantage to pacers but will also support batsmen. Peter Moor (w/c), Solomon Mire, Sean Williams, Sikandar Raza, Elton Chigumbura, Regis Chakabva, Timycen Maruma, Donald Tiripano, Kyle Jarvis, Tendai Chatara, Chris Mpofu, Brandon Mavuta, Ainsley Ndlovu, Tony Munyonga, Brian Chari, Craig Ervine. Mohammad Naveed (c), Qadeer Ahmed, Rohan Mustafa, Sultan Ahmed, Amir Hayat, Ashfaq Ahmed, Chirag Suri, Ghulam Shabbir (w), CP Rizwan, Shaiman Anwar, Muhammad Usman, Muhammad Boota, Imran Haider, Zahoor Khan. Mohammad Boota can replace CP Rizwan is the only probable change in UAE line-up. They are likely to go with same playing XI and seal the ODI series and can test their bench strength in the last match. Sikandar Raza is playing with an injury. If unfit, Brian Chari or Elton Chigumbura can replace him. Chris Mpofu can also get a chance if any pacer is rested. Rohan Mustafa, Ashfaq Ahmed, Ghulam Shabber (wk), Muhammad Usman, Shaiman Anwar, Chirag Suri, Mohammad Naveed (c), M Boota/CP Rizwan, Zahoor Khan, Imran Haider, Qadeer Ahmed. Solomon Mire, Regis Chakabva (wk), Craig Ervine, Sean Williams, Sikandar Raza, Peter Moor (c), Timycen Maruma, Donald Tiripano, Kyle Jarvis, Brandon Mavuta, Tendai Chatara. Captain and vice-captain choices: Sean Williams, S Raza, R Chakabva, K Jarvis, D Tiripano, T Chatara, Rohan Mustafa, Shaiman Anwar. If you liked UAE vs ZIM Dream11 team prediction, then follow us on Twitter for Latest Cricket News and Grand League teams.